The narrator of this Puran is Shri Lomharshan Rishi Ji, who was the disciple of Shri Vyas Rishi and who is also known as Soot Ji. Shri Lomharshan Ji (Soot Ji) told that previously Shri Brahma Ji had narrated this knowledge to Daksh-etc eminent sages. I will narrate the same. In the Adhyay named "Srishti ka Varnan" (Description of Nature) of this Puran (page 277 to 279) it has been stated that Shri Vishnu Ji is the basis of the whole world, who is in the form of Brahma, Vishnu and Shiv does the production, preservation and destruction of the world. I salute to that God Vishnu. One who is always everlasting-true form and the primary cause unmanifested Prakriti; she only is called Pradhan. From her only, Purush has created the world. Consider the immeasurably brilliant Brahma Ji to be Purush. He creates all the living beings and is dependent on God Narayan. The self-existent (Swayambhu) God Narayan created the water. Because of being born of Narayan, the water started being called as Naar. First of all God took rest on water. Therefore God is called Narayan. God released his power in the water, from it a golden egg appeared. It is heard that in that only the swayambhu Brahma Ji was born. After residing in the egg for a year, Shri Brahma Ji broke it into two pieces. From one Dhoolok (city of gods in the sky) was formed and from the second, Bhoolok (Earth). Thereafter Brahma Ji made Rudra appear from his anger. The above-mentioned knowledge has been said by Rishi Lomharshan (Soot Ji), which is hearsay (lokved), is not complete. Because the speaker is saying that, this has been heard. Therefore for complete information of Shri Devi MahaPuran, Shri Shiv MahaPuran, Shrimad Bhagwad Gita and four Vedas and the Tatvgyan (true spiritual knowledge) given by Purna Parmatma which is known as Swasam Ved i.e. 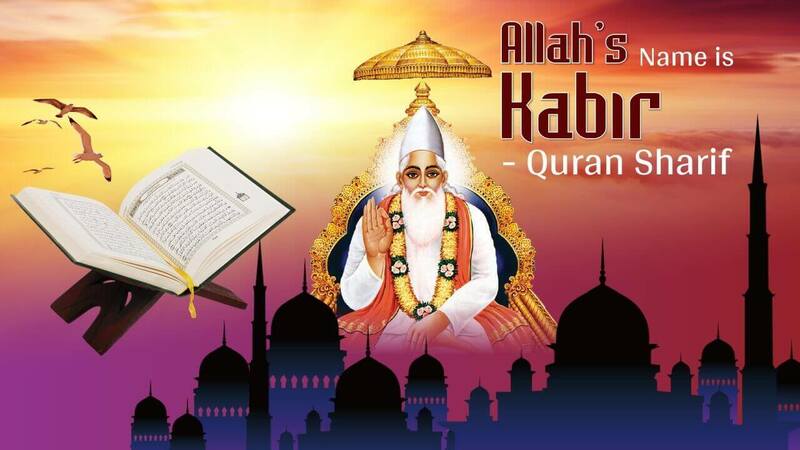 Kavir Vaani (Kabir Vaani/Kabir Speech), please read Swasam Ved in 'Gahri Nazar Gita Mein', 'Parmeshwar Ka Saar Sandesh', 'Paribhasha Prabhu Ki' and book 'Yatharth Gyan Prakash Mein'. Shri Parasar Ji has also called Kaal / Brahm as ParBrahm, and has also called Brahma as well as Vishnu, and has also called him as Anaadi i.e. Amar (Immortal). This Brahm i.e. Kaal does not have birth-death. From this only, Rishi's immature mind becomes evident. Please think: - The knowledge of Vishnu Puran has been said by a Rishi, who has said on the basis of Lokved (hearsay knowledge i.e. baseless stories), and the knowledge of Brahma Puran, Shri Lomharshan Rishi had heard from Daksh-etc Rishis; he has written that. Therefore to understand both (Vishnu Puran and Brahm Puran) mentioned above, help will be taken from Shri Devi Puran and Shri Shiv Puran, which Shri Brahma Ji himself narrated to his son Narad Ji, which was received and written by Shri Vyas Ji. The knowledge of the other Purans cannot be similar to the knowledge of "Shri Devi Puran" of Shri Brahma Ji because it was directly received by Narad Ji, and Vyas Ji had written it. Therefore to understand other Purans, assistance will be taken from Shri Devi Puran and Shri Shiv Puran. Because this knowledge has been given by Daksh-etc Rishis' father Shri Brahma Ji. To understand Shri Devi Puran and Shri Shiv Puran, assistance will be taken from Shrimad bhagwad Gita and the four Vedas. Because this knowledge has been imparted himself by God Brahm in Kaal-form, who is the originator i.e. father of Brahma, Vishnu and Shiv Ji. To understand the knowledge of Holy Vedas and Holy Shrimad Bhagwad Gita Ji, we will have to take help from Swasam Ved i.e. Sukshm Ved which has been given by Kaal-form Brahm's originator i.e. father Param Akshar Brahm (KavirDev); which SatPurush, on appearing, had Himself uttered through (KavirgirbhiH) Kavir Vaani / Kabir Speech. (Evidence is in Rigved Mandal 9 Sukt 96 Mantra 16 to 20). And in Shrimad Bhagwat Gita God Kaal i.e. Brahm has himself explained his state, which is true. In Gita Adhyay 15 Shlok 18, has said that I (Kaal-form Brahm) am superior to all the living beings in my twenty-one brahmands. Whether they are perishable in material body or are imperishable in soul-form. Therefore, on the basis of Lokved (hearsay knowledge) I am considered to be Purushottam. In reality, Purushottam is some one other than me (Kshar Purush i.e. Kaal) and Akshar Purush (ParBrahm). He only is actually called Parmatma i.e. God. He, entering into the three loks, nurtures and protects everyone. He only, in reality, is the Imperishable/Eternal Supreme God (Gita Adhyay 15 Shlok 16, 17). Brahm, the giver of the knowledge of Gita, is himself saying that oh Arjun! You and I have had several births. You do not know; I know. There is evidence in Shrimad Bhagwad Gita Adhyay 4 Shlok 5 and Adhyay 2 Shlok 12, and in Adhyay 7 Shlok 18, has called his sadhna also as (Anuttamam ) very bad/inferior. Therefore has said in Adhyay 18 Shlok 62 that oh Arjun! Go in the refuge of that Supreme God in every respect; by His grace only you will attain supreme peace and will attain the lok which will never be destroyed i.e. Satlok. In Adhyay 15 Shlok 4, has said that when you find a Tatvdarshi (who is mentioned in Gita Adhyay 4 Shlok 34 and Adhyay 15 Shlok 1), after that you should search for that Param Pad of Parmeshwar1 , having gone where, worshippers do not return to the world i.e. attain complete salvation; the Supreme God from whom this whole world originated and He only is the sustainer of all. I (the giver of the knowledge of Gita) am also in the refuge of that Aadi Purush Parmeshwar. One should only do His bhakti sadhna i.e. worship with full faith.